If you are interested in nothing but DuxaUI, you can grab the standalone version HERE or HERE. For Duxa's All in One Installer read below. Note to previous version users - Simply download and run it like you did the first time, it will overwrite any of the old files with new changes. This was written to work specifically with Project 1999. There are plethora of options and it should tackle most people's problems and issues. No more copying and dragging and dropping files. To get going on Project 1999 you literally install EQ:Titanium, and run this installer, and a click later just use the shortcut on your desktop to play. This works also on copies that are already configured for Project 1999 and on brand new untouched installs. Simply run the installer and pick what you would like to do. * Installs EQemu for easy launching (as of Oct 2013 auto patching has been discontinued for P99). * Choice of Original/Kunark login screen. * Choice of any loading screen from the the original and all expansions. * Installs DuxaUI and Velious era UI (use /load duxaui and load /velious when in game). * Changes the combat music to classic combat music (in mp3 format). * Fixes multi-core CPU problems. * Gives an option to delete everything un-needed after Velious. This cuts down the game by about 1.68GB. * Fixes Male Human/Half-Elf helmet transparency bug. * Fixes underwater sound cutting out after a few seconds bug. 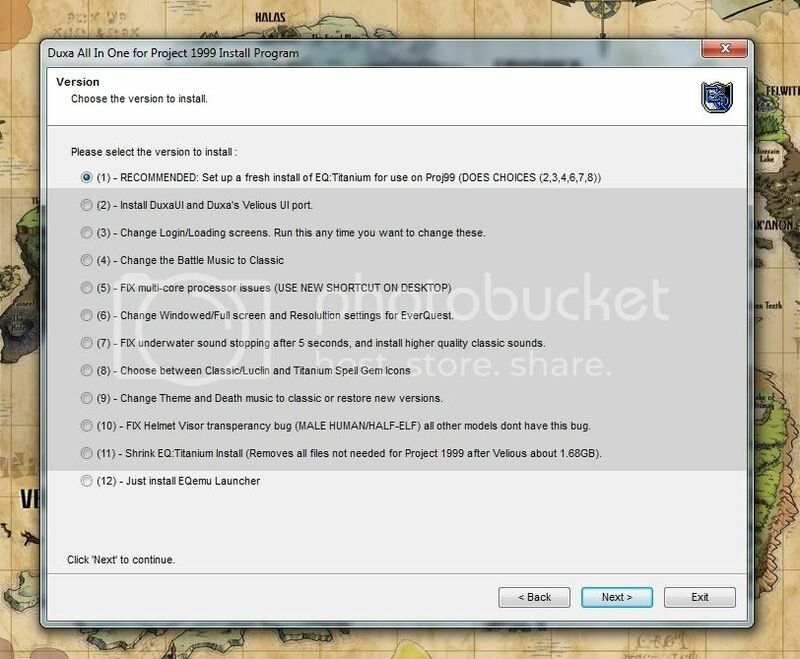 * Allows you to choose Windowed/Fullscreen resolutions during the install (or at any time). * Installs better quality classic sounds. * Allows you to change Theme Music and Death Music to classic versions. * Choose between Classic/Luclin/Titanium spell icons. - Health/Mana/Endurance/XP bars all in one convenient location. - Big healthpoint and mana readout for convenience. - Easy readable and clickable spell gem buttons. - A lot of custom UIs only show current weight ( I have no idea how you are supposed to know your maximum weight). So I added curr/total weight readouts to both inventory and player healthbar window. - Level readout on player window. One thing that was a bummer, when I looked at my old screenshots I couldnt tell what level I was when they were taken. * As a basis I used VertUI, since that is what I used when I played a decade ago. Huge thanks to Savok for porting the base VertUI to Proj 1999 which served as the basis for this UI. Problem: My game is hitching even with the CPU fix, or things dont look right in general. Problem: Cant enter full screen mode. The game just gives a black screen. Solution: Use ALT+ENTER to switch between full/windowed mode instead of in-game options. Problem: When in full screen, clicking certain parts of the screen brings the game back to windowed mode or minimizes it. Solution: Go to where EQ is installed and find "eqclient.ini" open it with notepad and find the line that says "WindowedMode=TRUE" and set it to "FALSE", also check to make sure that lines "Width=<number>" and "Height=<number" are set to your monitor's resolution. Problem: No matter how many times I change the loading screen it always reverts back. 2) Go to \EverQuest\Resources\ and make loadscreen.jpg read only, by right clicking on it and going to properties. With this setting EQemu will give you errors about inability to replace the file with the default one. But thats what we want, so just OK the error. It does not effect anything else at all. - Updated to support "The Ruins of Kunark" expansion. - Added the ability to install just the new spellfiles without installing anything else. - Removed CPU fix from (0), because not everyone needs it. It is still available as a standalone option. - Option (0) renamed to (1). - Added a warning to option (1) and (6) that keybindings will be reset to defaults. - Updated to support the new spellfile (v8) released April 17, 2011. - Ported Velious UI with background textures, and added it to Option (2). Use /load velious when in game. - Updated to support new spellfile (v10) released May 29, 2011. - Few bug fixes related to installer execution. v0.10 - skipped in order to get versions in sync with spellfile releases. v0.11 - skipped in order to get versions in sync with spellfile releases. - Added eqgame.dll and wsock32.dll to (1,13) as they are now required by the server and are provided with the new spellfile. - Removed cartography fix option since Maps were turned off on the server. - Replaced Update Spellfile option with Install EQemu Launcher option, since it will automatically keep th spell files up to date. - Integrated spellfiles v14 into this build, but should no longer need to update them with EQemu launcher support. - Option (5) is now legacy. Try using the EQemu launcher built in function to use 1 core first. If it doesnt work use this option. - Removed non EQemu shortcut. If you want to bypass EQemu you can still use the Start Menu shortcut. - Added an option to revert to the original login screen (Opt 3). Note: You must have changed the login screen with v0.15 or later. - Updated integrated EQemu Launcher to 1.81. - Added an option to revert to the original underwater and low quality sound effects (Opt 7). Note: Supports v15 or later. - Updated the integrated spellfile to v30. - Minor cosmetic fixes in the installer. Thank you very much. I'm going to install your UI this evening, it looks very good. And I'll tell my brothers about this, they're having problems with their dual core machines (I've already my good old single core so I'm fine with that). Add the revamped sounds that were posted in this forum. Add the newer town/environment textures if you haven't. For me, the new textures won't work with the transparency patch. I think I'd rather have just the transparency patch if I could choose just one. wait..really? Then I must be doing something wrong. I'll test this again. edit: confirmed, I'm just silly. When you do the graphics update you still have to redo the transparency patch, but one does not make the other stop working. Last edited by Lazortag; 02-28-2011 at 02:51 AM.. I get directory doesn't exist and invalid directory when I try to run this. Will this work with SoF, that is what I used to start my game? Great ideas, I will add transparency for sure. The other two I will have to check out how big they are. If adding those would make the installed double or triple in size I may have to create a separate installed for those two.